There are a number of forces currently competing for control of forex markets: the ebb and flow of risk appetite, Central Bank currency intervention, comparative economic growth differentials, and numerous technical factors. Soon, traders will have to add one more item to their list of must-watch variables: interest rates. Interest rates around the world remain at record lows. In many cases, they are locked at 0%, unable to drift any lower. With a couple of minor exceptions, none of the major Central Banks have yet raised their benchmark interest rates. The same applies to most emerging countries. Despite rising inflation and enviable GDP growth, they remain reluctant to hike rates for fear that they will invite further speculative capital inflows and consequent currency appreciation. Emerging markets countries can only toy with inflation for so long. Over the medium-term, all of them will undoubtedly be forced to raise interest rates. The time horizon for G7 Central Banks is a little longer, due to high unemployment, tepid economic growth, and price stability. At a certain point, however, inflation will compel all of them to act. When they raise rates – and by much – may well dictate the major trends in forex markets over the next couple years. Australia (4.75%), New Zealand (3%), and Canada (1%) are the only industrialized Central Banks to have lifted their benchmark interest rates. However, the former two must deal with high inflation, while the latter’s benchmark rate is hardly high enough for carry traders to take interest. In addition, the Reserve Bank of Australia has basically stopped tightening, and traders are betting on only one or two 25 basis point hikes in 2011. Besides, higher interest rates have probably already been priced into their respective currencies (which is why they rallied tremendously in 2010), and will have to rise much more before yield-seekers take notice. China (~6%) and Brazil (11.25%) are leading the way in emerging markets in raising rates. However, their benchmark lending rates belie lower deposit rates and are probably negative when you account for soaring inflation in both countries. The Reserve Bank of India and Bank of Russia have also hiked rates several times over the last year, though again, not yet enough to offset rising prices. Instead, the real battle will probably be fought primarily amongst the Pound, Euro, Dollar, and Franc. (The Japanese Yen is essentially moot in this debate, and its Central Bank has not even humored the markets about the possibility of higher interest rates down the road). The Bank of England (BoE) will probably be the first to move. 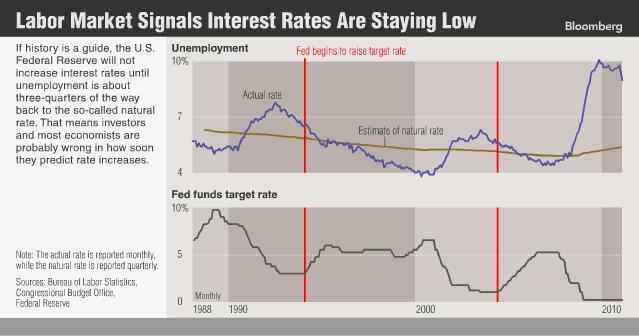 “The present ultra-low rates are unsustainable. They would be unsustainable in a period of low inflation but they are especially unsustainable with inflation, however you measure it, approaching 5 per cent,” summarized one columnist. In fact, it is projected to hike rates 3 times over the next year. 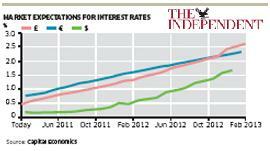 If/when it unwinds its quantitative easing program, long-term rates will probably follow suit. The European Central Bank will probably act next. Its mandate is to limit inflation – rather than facilitate economic growth, which means that it probably won’t hesitate to hike rates if inflation remains above its 2% threshold. In addition, the front runner to replace Jean-Claude Trichet as head of the ECB is Axel Webber, who is notoriously hawkish when it comes to monetary policy. Meanwhile, the Swiss National Bank is currently too concerned about the rising Franc to even think about raising rates. That leaves the Federal Reserve Bank. 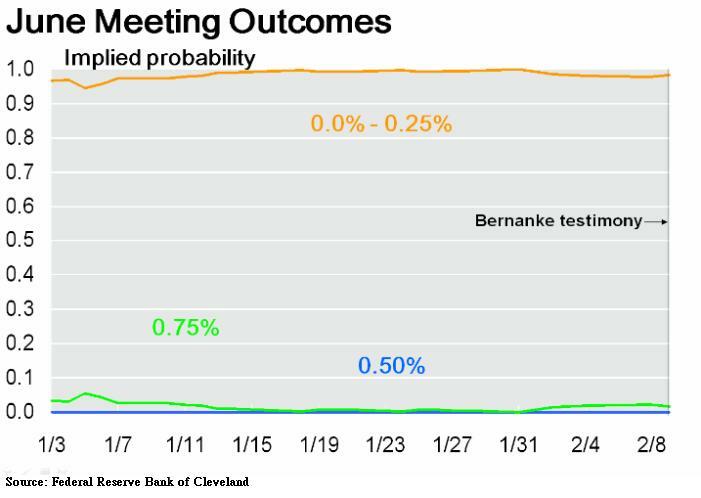 Traders were previously betting on 2010 rate hikes, but since these have failed to materialized, they have pushed back their expectations to 2012. In fact, there is reason to believe that it will be even longer than that. According to a Bloomberg News analysis, “After the past two U.S. recessions, the Fed didn’t start raising policy rates until joblessness had fallen about three- quarters of the way back to the full-employment level…To satisfy that requirement, the jobless rate would need to be 6.5 percent, compared with today’s 9 percent.” Another commentator argued that the Fed will similarly hold off raising rates in order to further stabilize (aka subsidize) banks and to help the federal government lower the real value of its debt, even if it means tolerating slightly higher inflation. When you consider that US deposit rates are already negative (when you account for inflation) and that this will probably worsen further, it looks like the US Dollar will probably come out on the losing end of any interest rate battles in the currency markets. there might high interest rate that cause AUD curreny increased gradually into the good sign. but of course they also consider all fundamental factors. I love USDJPY pair, I think USDYEN stays above 83.09 support and remains in uptrend from 81.13, the fall from 83.96 is treated as consolidation of uptrend. As long as 83.09 support holds, uptrend could be expected to resume and one more rise towards 84.49 resistance is still possible. However, a breakdown below 83.09 will indicate that a cycle top had been formed at 83.96 level on 4-hour chart, and the rise from 81.13 had completed, then the following downward move could bring price back to 82.00 area.